Do you want to create really special memories on your family holiday this year? Look no further than the Active Family Montenegro Holiday. Why not forgo the usual hotel, pool, screen-filled traditional family holiday where you traipse (or let's face it, drag your kids) around the sights and substitute it for something they'll really love? This holiday is an action-packed adventure that will have your kids raving about how this was the best holiday "like EVERRR!" Your kids are guaranteed to collapse into bed at night with a smile on their faces! 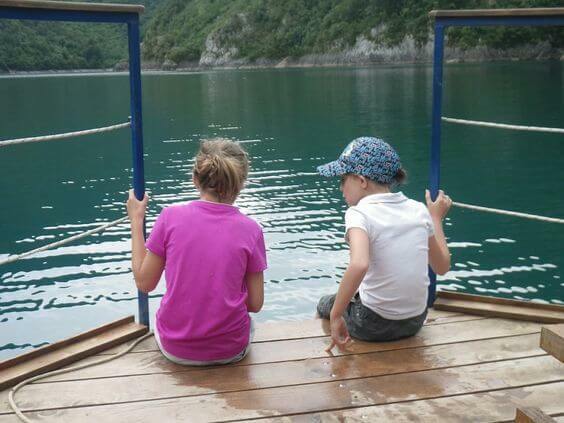 This is the perfect trip for families who want to explore Montenegro's natural beauty, get outdoors... and have lots of fun together! Click on any of the pictures on this page to open the picture gallery. I love this trip for families because the activities included suit the whole family and it's a great chance for families to bond and create special memories together... and isn't that what family holidays are about? The other thing I love about this trip is that it's totally customisable. 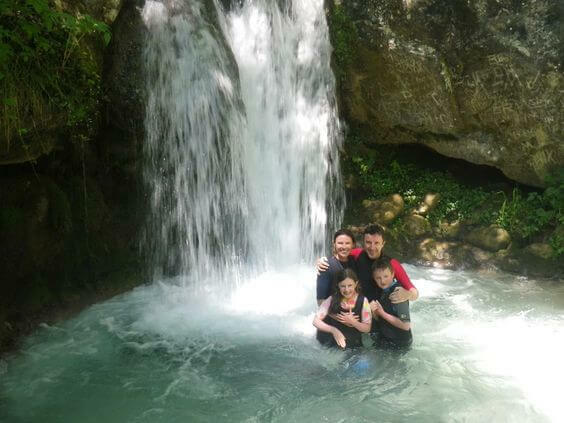 Marko, who organises this tour, will help you create the Montenegro holiday of your family's dreams. All you need to do is fill in the form below and Marko will help you tailor the holiday if it doesn't suit you as is. On arrival at either Tivat, Podgorica (both Montenegro airports) or Dubrovnik airport (in Croatia), you'll transfer over to an ethno village around Piva Lake. No matter where you're flying into, you'll see some of Montenegro most beautiful scenery along the way. Your accommodation is in authentic Montenegro bungalows where you can expect warm hospitality and delicious Montenegrin mountain food of breads, stews, cheeses and roast meats. 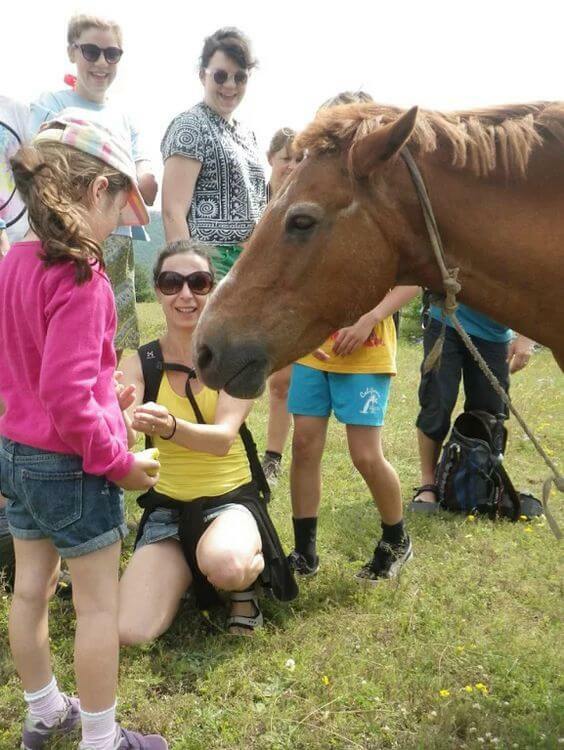 You'll also get to explore the local countryside and meet the locals! Rafting in the Tara Canyon, the deepest canyon in Europe, is a must-do experience in Montenegro. The start point is a short and scenic drive from Piva Lake and then it's off down the river. The scenery down the river is beautiful and there are lots of spots to take pictures. A Go Pro is a must-have item if you want to record the trip. About half way down, you stop for a rest and to swim under a waterfall... well the water is very cold, so it's usually more like a dip! 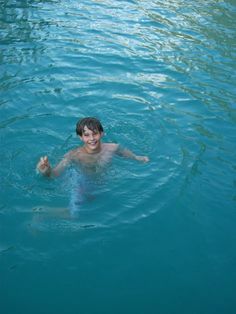 Fancy a dip in 4 degree water?! You can read more about rafting in Montenegro here. After rafting, you head back to your accommodation at Piva Lake for a well-deserved rest. 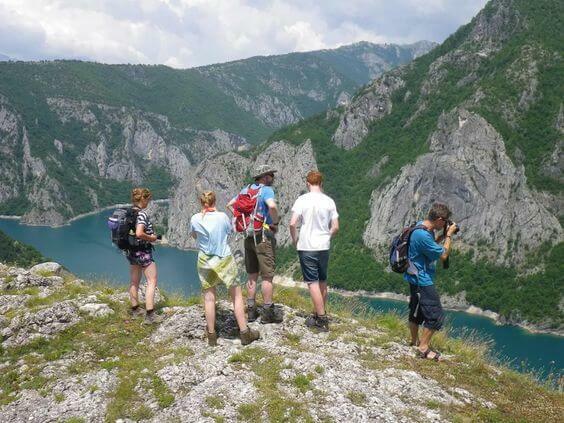 On the third day you make your way up the hills surrounding Piva Lake on a relaxing hike. From here you'll get stunning views of the whole area. After the hike it's time to head off on a cruise on the lake. You can just sit back and enjoy the views or try your hand at a bit of fishing and go for a swim in the lake. This is a very exciting day! On day 4 your family will tackle Rikavac Canyon. 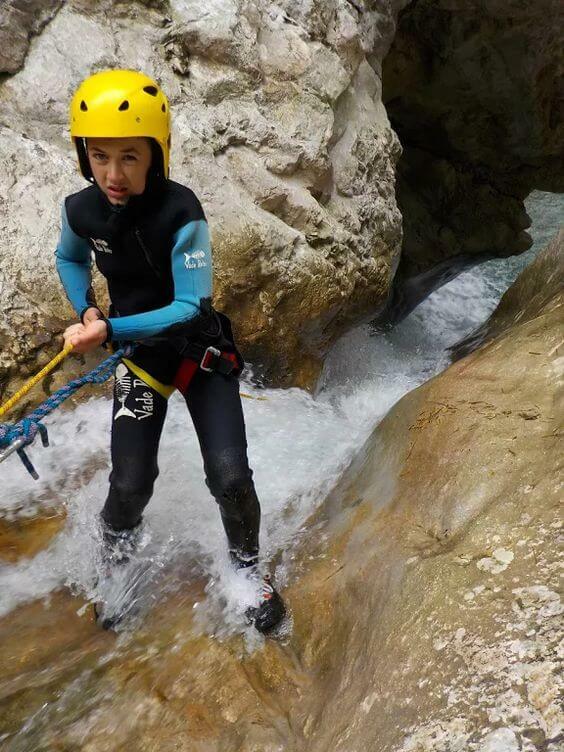 Kitted up with wetsuits, harnesses and ropes, you'll navigate the canyon's waterfalls and pools at a team. Your kids will be thrilled when they jump and abseil down waterfalls. It's a great story to tell all their friends when they get home and an enormous confidence booster when they finish! 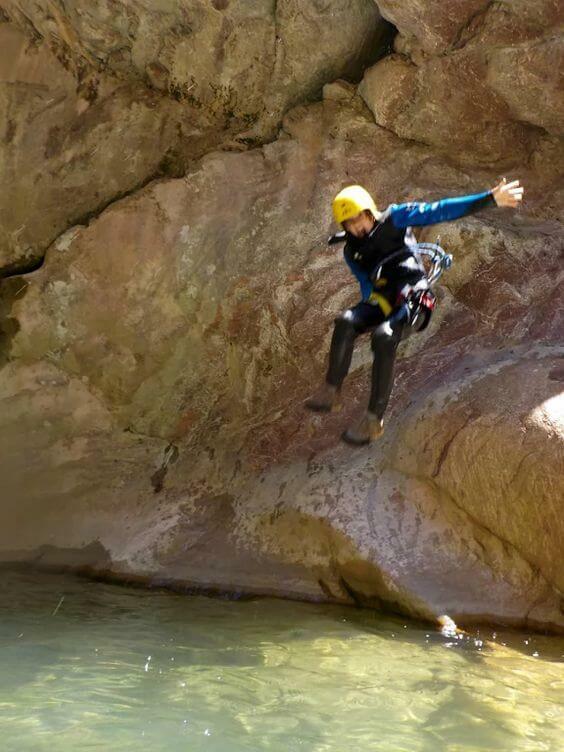 You can read more about canyoning in Rikavac Canyon here. Rikavac Canyon is near Bar, on the south coast, so you'll take another drive through Montenegro's beautiful countryside and along the coast. After canyoning, you'll head over to your 3* hotel in Bar old town. This is a fascinating ruined old town that has amazing aqueducts. I highly recommend a visit! Today you'll head over to Skadar Lake, a short trip from Bar and one of Europe's most important bird reserves. 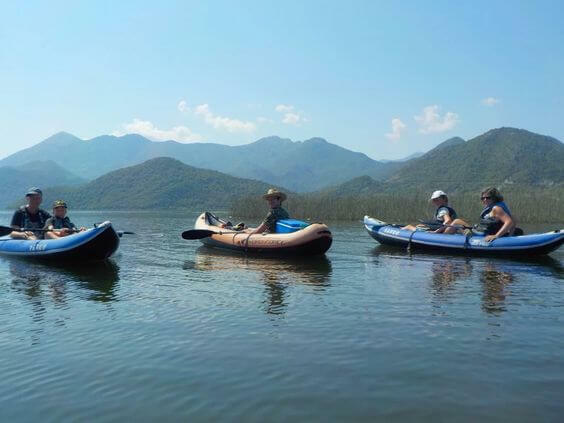 You'll take a guided kayaking tour on the lake where you'll be able to see rare birds and swim in the lake. After exploring the lake, you'll return to Bar for the night. Explore Ulcinj and enjoy a beach day on the sandy beaches there. Head north and explore the Budva Riviera, Sveti Stefan and Budva old town. Explore Bar old town in the morning and the Bay of Kotor in the afternoon. Go stand up paddling or choose another excursion from Kotor. Take a half day boat cruise from Bar. You'll be transferring over the Bay of Kotor today, where you'll spend the night in 4* accommodation. You start the day with a drive up Kotor Bay's famed 'serpentine road'. 25 hairpin turns make this road a winding route, but the scenery is breathtaking. You'll get views over the whole bay from the top. Check out the view on the way to Lovcen National Park! 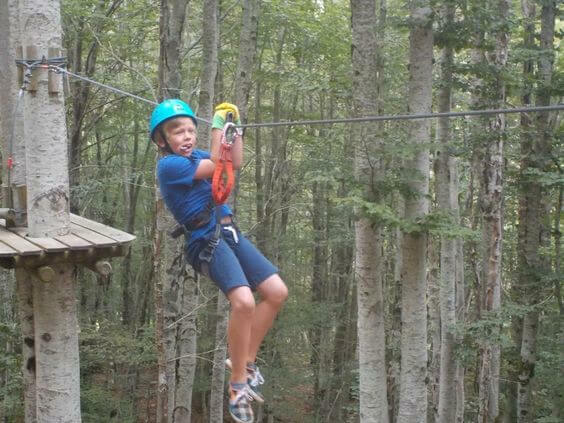 You'll head into Lovcen National Park and up to the Adventure Park at Ivanova Korita. 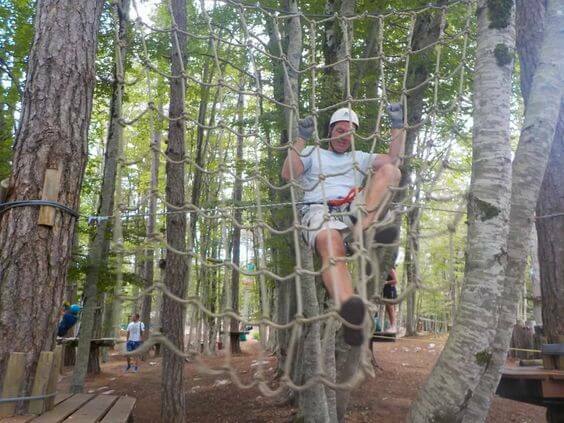 The park has a set of ropes courses to suit everyone - from easy courses to a challenging course for the most athletic participants. There's also a zipline ride. What a sense of achievement... and fun! Ivanova Korita is a great place for kids. There are big grass fields (bring a ball! ), playgrounds, picnic tables, barbecues and a fantastic, authentic restaurant. After a full day, you'll head back down to the bay for the night. You'll transfer back to the airport or your next destination if your adventures continues! Return transfers from Tivat, Podgorica (both in Montenegro) or Dubrovnik (Croatia) airports. If you need transfers to/from another location, you can request a quote for those. Read more about the airports here. Meals: 7 breakfasts, 3 lunches (1 packed lunch), 5 dinners. 7 activities with English-speaking guides (rafting, hike, lake cruise, canyoning, kayaking, adventure park and zipline). 7 nights' accommodation (3 nights in an ethno village, 2 nights in Bar, 2 nights in Kotor Bay). All equipment for activities including wetsuits, booties, helmets, harnesses and life jackets. Licensed, English-speaking rafting skipper, canyoning guide and kayak instructor. €825 per adult and children aged 13 and over. €695 per child aged 8-10. If this sounds like just the thing for your family's dream holiday, you can enquire to book with the form below. Marko will get back to you straight away. Marko creates fantastic 'out of the ordinary' Montenegro holidays that get rave reviews. You can see Marko's reviews on Trip Advisor here. You can rest assured that with your holiday plans in his hands, your trip will be one your family never forgets. Don't forget, if the itinerary above doesn't quite suit you, Marko can tailor a holiday just for you. Just pop your requirements into the form below. Once you've booked your unforgettable trip, you should make sure you have a way for your kids to remember their holiday. When I was 11, I spent 10 weeks with my best friend's family travelling around Europe, Canada and the United States. At the end of every day, we recorded what we did and what we saw that day. To this day, I still treasure this book and those memories. These days you can get travel journals for kids that they just fill in - add in a box of coloured pencils and you've got the perfect end of day activity for your holiday. We have this journal and it's been invaluable for going over the day's activities and recording our feelings about our trips.